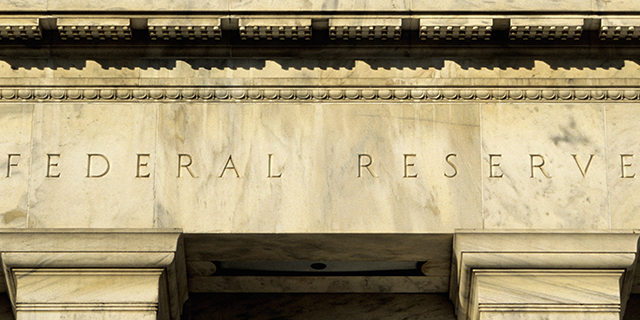 With the Federal Reserve raising interest rates for the first time in nearly a decade, views of the institution are not immune from today’s politically polarized climate. In 2014, roughly half of Americans (47%) had a favorable opinion of the Fed and 37% had an unfavorable view. But Republicans, especially conservative Republicans, were more likely to view the institution unfavorably. Democrats and Democratic-leaning independents expressed favorable opinions of the Fed by a roughly two-to-one margin (57% vs. 28%). Only 39% of Republicans and Republican-leaning independents said the same, while nearly half (48%) expressed an unfavorable opinion. Among conservative Republicans, 54% viewed the Fed unfavorably, while just a third had a favorable opinion. Moderate and liberal Republicans were more likely than conservatives to view the Fed favorably (47%). Differences in opinion among Americans of different incomes were relatively modest, though those with higher incomes were more likely to have an opinion of the Federal Reserve. However, the partisan gap in views of the Fed was much sharper among high-income Americans (those with family incomes of at least $150,000) than among those with lower incomes. 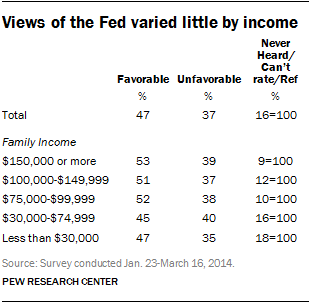 Roughly three-quarters (74%) of high-income Democrats had a favorable impression of the Fed, a view shared by just 40% of high-income Republicans (54% of whom viewed the Fed unfavorably). Democrats with family incomes of between $75,000 and $150,000 also had broadly positive views of the Fed (66% favorable, 24% unfavorable), while Republican views were divided (44% vs. 45%). Democrats with incomes of less than $30,000 felt less positively toward the Fed than did higher-income Democrats. Just 53% viewed it favorably, while 30% viewed it unfavorably. As a result, views among low- income households were not as polarized, but there was still a 13-percentage-point partisan difference in favorable views of the central bank (53% of Democrats vs. 40% of Republicans). Recent Pew Research Center surveys have found that Janet Yellen, the current Fed chair, and Ben Bernanke, her predecessor, are not well known among the public. Among those who were familiar enough with each to rate them, Bernanke’s favorable rating stood at 54% in March 2008, before the financial crisis peaked in the fall of that year. Republicans and Republican leaners expressed far more favorable opinions of Bernanke (71%) than did Democrats and Democratic leaners (45%). In September 2013, toward the end of his tenure, partisan views of Bernanke had shifted: 69% of Democrats viewed him favorably, compared with 43% of Republicans. In early 2014, Democrats had a more favorable opinion of Yellen, President Barack Obama’s choice to succeed Bernanke (79% favorable). 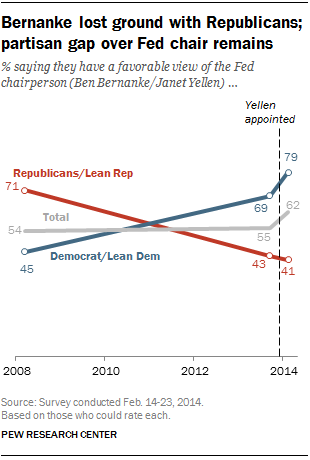 However, Republicans viewed Yellen about as favorably (41% favorable) as they had Bernanke a year earlier. Alan Greenspan – Bernanke’s predecessor – was also not very well known among the public in May 2000. Among those who offered an opinion, however, views of Greenspan were quite positive: 76% had a favorable opinion. There was also no partisan difference in opinion – equal shares of Republicans and leaners and Democrats and leaners (76% each) reported a favorable view of the then-chair.